This section provides a quick introduction of 3 categories of event relations in Minkowski spacetime: lightlike events, spacelike events and timelike events. # Relation of interval, time and space. Lightlike Events - Two events with a zero interval square: s**2 = 0. Spacelike Events - Two events with a positive interval square: s**2 > 0. Timelike Events - Two events with a negative interval square: s**2 < 0. 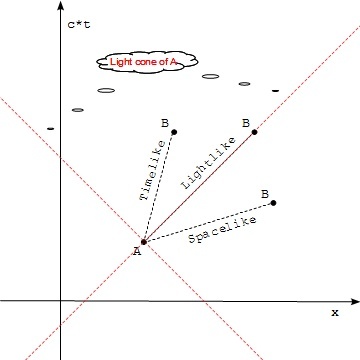 A and B are lightlike, if B is on the light cone of A. The interval square between A and B is zero: s**2 = 0, or dx**2+dy**2+dz**2 = (c*dt)**2. In this case, Bob at event B can "instantly see" event A, if B is in the future. This is because information (light) from event A arrives at event B at the same moment when Bob opens his eye. A and B are spacelike, if B is outside the light cone of A. The interval square between A and B is greater than zero: s**2 > 0 or dx**2+dy**2+dz**2 > (c*dt)**2. In this case, Bob at event B will never affected by event A, even if B is in the future. Or we can say that B is separated from event A with too much space and too less time to be affected by A. A and B are timelike, if B is inside the light cone of A. The interval square between A and B is less than zero: s**2 < 0 or dx**2+dy**2+dz**2 < (c*dt)**2. In this case, Bob at event B can be affected by event A, if B is in the future. Or we can say that B is separated from event A with less space and enough time to be affected by A. Amy from event A can take a high speed train to arrive at event B and meet Bob.